Two things happened recently that came together in a very interesting way. First, I got access to several hundred acres of new hunting property that I'm not very familiar with. Second, I finally gave up the old flip phone and got myself a crackberry, er, Blackberry. I was pretty sceptical about whether I would like the Blackberry at first. My standard speech to my kids has always been, "Harumph! Why would I want one of those fancy phones? All I want is something that rings when someone wants to talk to me and that makes your phone ring when I want to talk to you." Well, once again, my old crumudgeonly ways have been proven outdated. 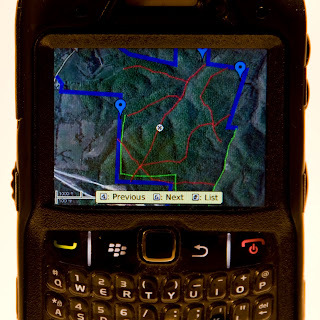 As a matter of fact, I now consider the Blackberry to be one of the neatest pieces of hunting gear to come down the pike in a long time, thanks to the free Google Maps application that can be downloaded onto the phone. With Google maps running on my Blackberry, I can access topo maps like the one above and aerial photos like the one below. The built-in GPS in the phone shows me exactly where I am on the map or photo. I can mark locations while I'm in the field with a star and when I get home, I can change the star to the push-pin type marker, add detailed notes, photos, even video to the location notes. I can access all of that information from my Blackberry at a later time if I need to refresh my memory about a particular spot. I have spent two mornings on the new property learning my way around and clearing trails. I had a paper topo map, a compass, and my Garmin eTrex GPS with me, but never pulled them out. 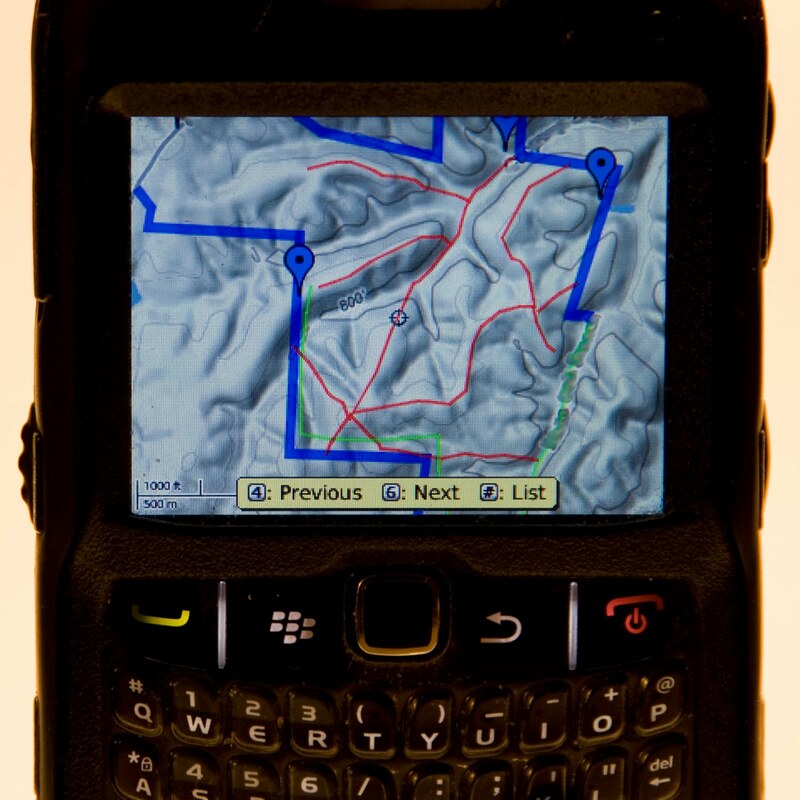 I was able to navigate quickly, easily, and accurately with nothing but my Blackberry. In future articles, I'll go into more depth on how I use the Blackberry and Google maps. 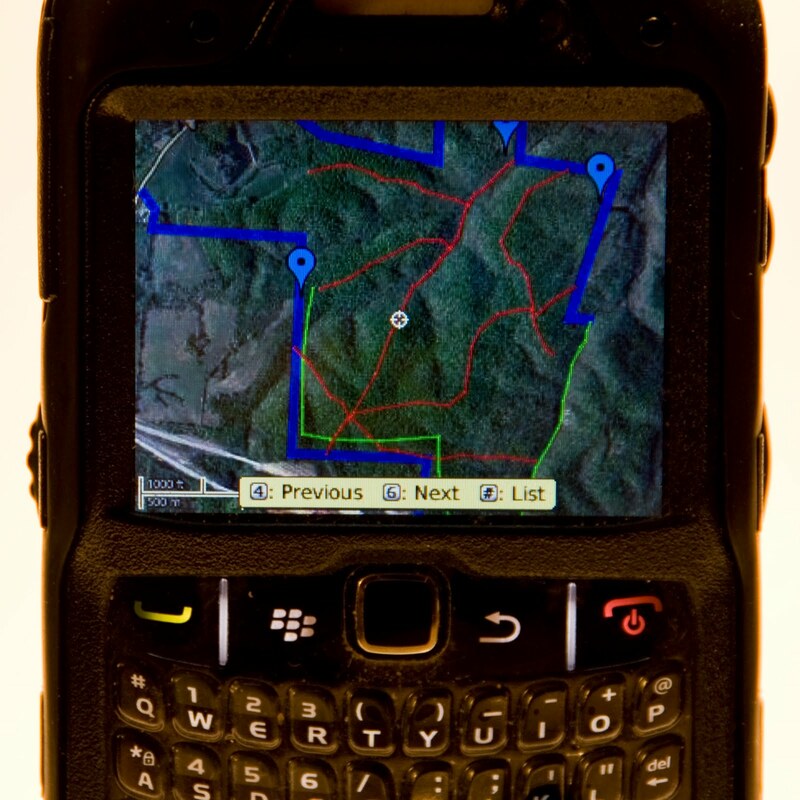 My prediction is that smartphones will make conventional GPS units obsolete in the near future, at least for users in areas with good cell coverage. For the time being, I'll still carry a GPS and a phone, but as my confidence grows I may just decide to leave the GPS in the truck. Never thought I'd say it, but I'm now a Crackberry addict. Modern technology can be amazing. I use Google Earth a fair amount to look over the properties I hunt before I scout them. I'm glad you mentioned google maps. I've been looking for something for my crackberry and hadn't considered that one. Google maps and Google earth work hand in hand. You can access Google earth through Google maps and see all the custom features like roads, boundaries, and markers that you added, but with the flyovers and other features of google earth.